Zaguristra, the Splendid City, Sul Dzaaristar, magical marvel that floats above the broad Twin Rivers valley in the Shaange Mountains was that centre. Here the world's magical lore was brought together, to be safeguarded and given only to those most deserving, and most worthy. However the ambition of being above politics has not been assiduously upheld, and over the centuries sorcerers have begun involving themselves, and manipulating the nations below the Splendid City more and more. Only a sorcerer is permitted to enter the Splendid City, and when they do they must forever forsake the person they were before. Their faces and hands are permanently marked, and form then on they live to serve Zaguristra, and the Concordance that speaks for it. A thousand years ago, a league of sorcerers arose and built a dark fortress in the Desolate Margins. Thoroughly corrupted by some sinister power, they worked evil magic from this Black City, threatening to bring all of central Zenth under their power until they were put down by the Shining Alliance of orcs, dwarves and dryads. 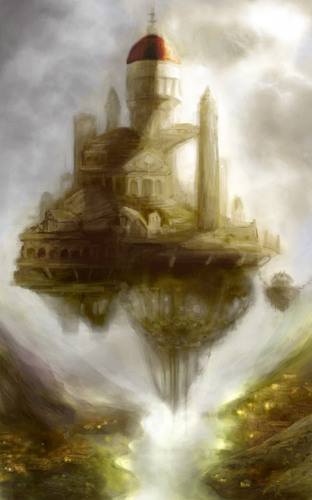 After the war, many sorcerers agreed they needed to remain aloof from politics to prevent this kind of corruption from recurring, and constructed a new centre of magic, literally above the world. Below the city the Twin Rivers Valley is a fertile plateau that inclines gently up to the slopes where the city is anchored. The valley is rich land, with soils made fertile by the proximity of the forests of the Golden Court, and by the summer melt off the mountains. It is a verdant, green land with tiny babbling brooks and miniature waterfalls cutting through fields of wild flowers and copses of beech and willow. The breeze is cool and carries the scent of fresh snow, and when it blows from the north, the earthy aroma of the forest. Cattle and sheep graze on the lower slopes of the mountains, and fields of corn and barley grow around a few pleasant hamlets, no larger than a half dozen thatched cottages clustered at the heart of their fields. Beehives and apple orchards sit in the north of the vale, and the people are welcoming and respectful, but are careful to keep to themselves. 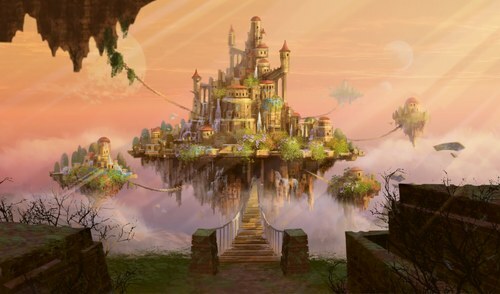 Over this idyllic place looms the flying city. Anchored by three immense chains to the slopes of the mountains, the city hovers impossibly in the air over the southern end of the valley like the throne of some ancient and all-powerful god. Build on a disc of land that looks like it has been ripped from the very earth, towers rise both above and below the disc, and on top rich gardens spill over the edges into the void, and round, domed structures of golden stone with terracotta rooves reach even further towards the heavens, joined by precarious sky walks and breathtaking sweeping verandahs. Waterfalls emerge from impossible springs, to trickle down artificial rivers and off the edges of the disc in a fine mist, and statuary of lifelike craft stands in the open air of lovely courtyards between buildings. Chained to the city, half a dozen miniatures of Zaguristra, with only three or four large buildings hover in equal splendour, though all are dwarfed by the central spires of the main city. Joined to the mountainside by a rickety rope bridge, the path to Zaguristra is a terrifying one, suspended incalculably high above the valley below, with nothing but old rope and creaking boards to rely on. Ahead of the approaching visitor, the cavernous main gates promise nothing but solidity and strength. For all its feeling of eternal presence, the Splendid City is far from stationary, and drifts on its moorings like a ship. In pleasant weather this gentle rocking is hardly noticeable except to those in the lower towers, who can see the shift of the land far below, but in high winds and storms the movements of the city can be more jerky and violent, as if the electricity in the air is filling Zaguristra with an unnatural vigour - a galvanised desire to soar above the clouds and thunder like the sun and moon. The gates of the Spendid City lead into the underworks; dormitories for the students accepted here, libraries and lecture halls, kitchens, storehouses and other such mundane facilities as are required to keep the denizens of the city in fine manner. The hall of welcoming, just within the gates, is the farthest any non-sorcerer has ever ventured into the city, and it is heavily guarded indeed by magical constructs and spells and curses so potent that even an army could not survive trying to pass further into the city, even without the intervention of the residents. Kitchens are run by ensorcelled ovens that make food of their own accord, and magical homunculi as insubstantial as the wind, or else made from brass, bronze or lead, perform the labour of the city under the watchful eye of ancient masters who glance up now and then from their tomes. The upper city is filled with the homes of the sorcerers who run the city, the tutors, and researchers, and defenders, and advocates, and envoys, and the agents of the Concordance. Not to mention the Equals themselves. Here each great tower and residence is independent of the rest of the city, having its own libraries, facilities, homunculi and the like as well as a comfortable residence for its owner. Here those places valued to the city, such as the necropolis, the secret libraries closed to all but the fully initiated, the vaults where items of great power are stored, and the council halls where both gathering of the Concordance and elections for their number are held. The satellites are some of the more unusual facilities of the city. As well as being the residences of the most powerful and solitary of the sorcerers of the Splendid City, they also house the prison known as the Tower of Solitude where unruly students are disciplined, and the fortress called the Tower of Forbearance that hovers low, and watches over the approaches to the city through the valley, and the ascent to the bridge. These two are the only satellites connected to the city proper by bridges, with the rest requiring flight to access. The secret of the Splendid City's flight is one only revealed to full initiates, if only because they need to be aware of the potential danger of the situation. A sealed chamber at the very core of the city serves as a prison for a powerful d'mon lord - perhaps the most powerful - referred to simply as the Doom of Zaguristra. The Doom was the source of the power of the Black City, and was stolen away by the founders of Zaguristra when that fell place was felled. Realizing that the creature could be used as a source of nearly limitless power, but also knowing the threat that such a malign being posed, those first sorcerers took a great risk, but it is one that has paid off as the years progress. And since such a terrible creature must continue to be imprisoned most sorcerers reason that keeping it weak by tapping its power whenever possible is sound strategy. The d'mon yearns and struggles and plots to be free, while the sorcerers both tap him as a source of mana and reinforce his bindings. However most agree that one day something will go amiss, and one day the very source of Zaguristra's power will also prove to be its downfall - perhaps literally. Zaguristra is, arguably, the most powerful single political entity in the world. Certainly it is accorded respect and reverence by the various rulers of Zenth that they afford no other. The city is ruled by a council of nine sorcerers, with each councilor, or Equal controlling a party of loyal followers, apprentices and henchmen whose loyalty is maintained by the promise of favour when the Equal takes or holds office and by the sharing of accumulated arcane knowledge and skill. Everyone in the city is a sorcerer (though fortune or lack of talent or patronage prevents many from progressing far, and many are destined to be little more than simple traders or servants) and those not initiated in the mystic secrets, or accepted to study them, may not enter. Sorcerers outside the city are usually either emissaries or renegades, and are certainly seen as such. The ruling council, the Concordance, numbers nine strong, and each member holds a different office with the associated responsibilities and duties. An Equal is elected for a nine year term, and each election is staggered, so that every year there is an election for one of the nine offices. Any master sorcerer in the city can place a vote, and competition is often fierce. There is no limit to how many terms an Equal can serve, and so most serve until their deaths thanks to the followings they cultivate during their terms. However steep turns in popularity are not unknown, and single-term Equals are documented more than once in the city's history. The nine offices and their duties are as follows: The Equal of Defenders, who is responsible for holding the city against all threats, external or internal, and policing the populace. The Equal of Emissaries, who is charged with all of the envoys and agents at large in the world on behalf of Zaguristra. The Equal of the Underworks, who is tasked with maintaining all of the mundane operations of the city, administering the civil service and collecting the offerings of the residents and assigning public works duties that allow the city to function, as well as managing the tithes and gifts from foreign powers that make the land wealthy and mighty. The Equal of Chains, who is ostensibly charged with maintaining the chains that anchor the city, but also keeps the Doom bound, and ensures its powers are sufficiently diverted to prevent it from breaking free. The Equal of Initiation is responsible for all of the students studying in the city, and must make himself available to them for all disputes and matters of learning, as well as overseeing the initiation ceremonies and examinations, and approving all prospective initiates. The Equal of Masters fills a similar role for the initiated sorcerers and potential masters. The Equal of Watchers, who gathers intelligence from agents at large in the world, oversees mighty divinations and scrying spells, as well as being concerned with the hunting and killing of renegades. The Equal of Secrets, who is charged with protecting many powerful items and dangerous knowledge, deciding if and when they should be used, and seeking out more such items and lore to add to Zaguristra's vaults. And finally the Equal of Electors, whose sole jobs are to oversee all elections to ensure that they are fair and lawful, and chair meetings of the Concordance. Paradoxically his purview also extends to his own election, and every recorded Equal of Electors is recorded as having served multiple terms. Renegades come in three forms; students who have fled the Splendid City during their training; envoys of Zaguristra who have ceased to serve the Concordance; or practitioners of magic who learned their craft from a master or tradition outside the city. In either case they are the sworn enemies of Zaguristra, and are offered little but death if caught. The goblin nations are a welcoming haven for (non-orc) rogue sorcerers, and while its resident sorcerers do not have the resources to train apprentices, their considerable power keeps the goblin cities hidden, in return for safe welcome to all newcomers. Likewise, there is a secret monastery somewhere in the Daaland Mountains, where the dwarves collaborate with rogue sorcerers, and rumours speak of a hidden sanctuary-grove where the treefolk harbour fugitives. The orcs once attempted to found their own academy of loyal sorcerers, but it was thoroughly destroyed in a cataclysm of magic designed to remind the races of Zenth of the power of Zaguristra, with the Concordance making it abundantly clear to the emperor that they did not tolerate rivals. Elves are generally distrustful of renegades, having had similarly bad experiences with them in the past, but they are welcoming enough to sanctioned emissaries. No matter how hard they try, no renegade has ever proven able to remove the tattoos that Zaguristra marks its initiates with, and so only those who have learned their art elsewhere have any hope of hiding amongst the settled lands of Zenth. Zaguristra collects a small tithe from each of its residents who earn money,and any sorcerer short of an Equal can be compelled to bend their talents to public service by the Equal of the Underworks. There are merchants and craftsmen within the city who make their living in mundane manner because they never passed from being students into being initiated sorcerers - because they were rejected by the Equal of Initiates too many times or failed to find a sponsor. They cannot leave Zaguristra with the knowledge that they have, but are allowed to go and trade with the villages of the valley. However this is but a small part of the city's economy, and these bakers and tailors and bookbinders and the like do not comprise a balanced economy. Zaguristra's real wealth comes from gifts, tithes and occasionally bribes from the mighty nations of Zenth. Where an envoy goes his services do not come cheaply, and while his new host are expected to be responsible for keeping him, the price for his service goes back to the vast coffers of the Splendid City, where he will find a rich welcome upon his return. With little need to spend excessively, and monstrous income, the coffers of Zaguristra alone may soon be enough to weigh down the city! It is easy to tell a sorcerer in Zaguristra, as it is to recognize them when they go abroad in the land. Tattooed with solid blocks of colour on the face and hands, they cannot hide what they are without entirely covering themselves. Usually half of the face, either the left, right, upper or lower regions are filled in red, blue, purple, green or even black, and the hands bear a spiral in the same colour on the palms. The magical pigments used are even capable of staining a dryad's bark down to the quickwood. Once they are admitted to study sorcerers must give up their former ties, forsaking their country, their race and even their families as things of the past of no consequence to them now. Oftentimes they will take a new name as well, to openly signify their rebirth as an adept of sorcery. As a result national costumes are not welcome in Zaguristra, and the sorcerers tend to adorn themselves in the turban and cloak that are the city's costume. Younger sorcerers will often wear trousers and vests under their cloaks, while elders prefer long furred or coats. Sorcerers do not go armed in the city - for what is a sword to one who can wield magic? - but many elders carry a walking staff, and even the younger initiates enjoy the solid presence and the satisfying tap of this unofficial symbol of office. Greys, dark blues and blacks seem to be the preferred colours, but anything can be obtained here in this city of wonders, and yellow, red and orange prove popular accents for cloak or vest. Often a sorcerer will choose a colour that accentuates his tattoos rather than matching them. Qalam, Equal of Initiation Qalam keeps his full name a close secret - rumour persists that he was brood-brother to the Padishar emperor himself, and forsook name to come to the Splendid City, though surely were that true history would not have so willingly forgotten him, and a better rouse than refusing a name would be concocted. Pajor Janaang, Equal of Watchers because no orc would accept a goblin, nor goblin accept orc, the dwarf pajor was elected equal of watchers, and it seems he couldn't be less interested in the post. They should probably have their own language…. or perhaps they have just embraced dwarvish as the most suitable tongue for magic.